As a Horseman, Bernie is renowned for not only his riding talents but for his teaching and coaching gifts. As a competitor, Bernie has represented the United States Equestrian Team both at home and abroad on many occasions and reached the top of the sport in all 3 of the International Equestrian Olympic disciplines: Show Jumping, Dressage, and Eventing. In 2009 he was inducted into the National Show Hunter Hall of Fame. 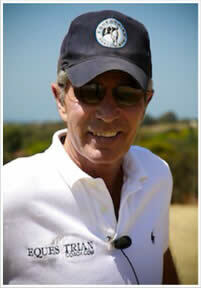 In 2010 the California Professional Horsemen's Association honored him with their Lifetime Achievement Award. In 2012 he was awarded the USHJA President’s Distinquished Service Award. He is recognized as a legend in the sport. As a teacher and trainer, he is one of the most sought after clinicians in the country today. His talent for teaching goes back to his roots where he was fortunate enough to have been educated by some of the very best Master Instructors this country and the world have to offer. He served as the West Coastʼs associate Chef d’ Equip to George H. Morris, the former Chef d’ Equip of the United States Olympic Equestrian Team. After amassing over 60 years worth of training and riding techniques and experiences with thousands of horses, Bernie is driven to give back to the sport that has given him so much fulfillment and success. Click here to learn more about Bernie. In Part 2 of Building Blocks to a Great Position, Bernie Traurig continues his progressive system to develop a solid foundation for jumping disciplines. With demonstrations by his daughter, Natasha, this video outlines exercises that enhance proper techniques. Bernie discusses all the different seats one uses on course and where they apply with show ring footage from some of the best Hunter, Jumper & Equitation Riders. Step by step Bernie takes us through a gymnastic that is designed to build the horse's confidence when negotiating combinations. The horse featured in the video has a history of stopping in combinations, but with Bernie's help, she overcomes her anxiety. If you like this video check out The Winkler Gymnastic another video that features the benefits of a gymnastic line. Bernie demonstrates how to properly tighten and loosen calks. Bernie shares his personal insights and recommendations on calks. His philosophy has been gained through decades of experience with thousands of horses. Then Darren Roberts shows you the proper way to puts calks in and take them out with detailed demonstrations of each step while emphasizing horsemanship and safety. A few years ago, in preparation for a clinic abroad, Bernie asked the clinic host to have some cavalletti at hand in the arena. The host refused to provide them because two pony club members had recently been injured when their horses tripped over the cavalletti and fell on their riders. He has taken this information to heart, and since then he warns his students about the potential danger of cavalletti when they are negotiated the wrong way. Cavalletti can be an invaluable tool when schooling your horse, so find out how be safe out there and use them the right way. Watch Brian’s journey from riding behind the vertical, out of sync with his mount, to beautifully riding with the motion of the horse. This summer Brian joined Bernie in Southern California at EquestrianCoach Ranch for an intensive workshop. He traveled all the way from Argentina for the chance to ride twice a day for seven days. This video documents his progress and stamps the merits of the American Forward Riding System. He arrived with a habit of sitting behind the vertical on his approach to the jumps. He had convinced himself that this allowed him more time to find a distance, but it really only served to interfere with the horse’s ability to jump and created various other complications on course.